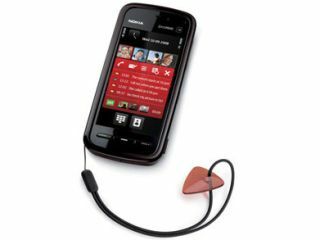 Nokia has finally ended months of speculation and rumour by today announcing the Nokia 5800 XpressMusic, previously known by the codename of the Tube. Sporting a full 3.2in haptic touchscreen with 16 million colours, this is the first device of its kind from Nokia as it unveils the first phone that could be dubbed an 'iPhone killer'. In fact Nokia says it's the best on the market... take that, Apple. Well, it's technically the second, if you count the 7710 from 2005, but that was far too ahead of its time, and was discontinued. The UI allows you to choose four people to become your contacts bar, allowing you to keep up with all the things they do, such as Facebook updates or emails and SMS chats with them all on the home screen, which is rather neat and novel. The 5800 XpressMusic sports a 3.2MP camera with Carl Zeiss lens and dual LED flash. It also has GPS for navigation and geotagging, which equals and beats the efforts of the iPhone 3G, although the screen is slightly smaller. It can record video, though only VGA. But still, there are some other phones out there that can't do that. AND it has one touch upload to 'your favourite video site', and uploads photos as easily too. The internet is also well catered for, as it allows you to browse the whole web, by supporting Flash. It is displayed in widescreen across the screen. Input is available through handwriting, QWERTY keyboard in fullscreen, as well as mini-QWERTY in portrait. There's also a traditional keypad for old-school fun. Nokia Maps is included as standard, which is hardly a surprise given the Finnish company is the only one trying to beat Google at its own game. There's a drop-down media bar in the top right corner of the screen for internet, photos, music et al, and is accessible from any application or function on the phone. This gives easy access to the Nokia Music Store, with easy over-the-air downloads. It has hi-power surround-sound speakers, which mean the children on the buses will be able to annoy more people in higher definition. With acoustical and bass boost, they are the loudest mobile phone speakers on the market today. The device runs the S60 5th edition operating system, which some have said might be a little lightweight for the phone that everybody has been waiting for with bated breath, hoping it matches up to the might of the iPhone. Wi-Fi and HSDPA connectivity are also included in the package, which is hardly a surprise from a flagship device from Nokia, so the web applications will be well catered for if that's what you're into. For the movie and music buffs out there, you'll both be pleased to know there's a 3.5mm headphone jack on the device, and true to its Tube name, a TV out socket too so you can throw content onto the big screen as well. Memory comes in 16MB internal flavours, though there will be an 8GB MicroSDHC in the box, expandable up to 16GB with the new variety of memory cards recently released onto the market. It will be available shortly at a price of €279 unsubsidised, which frankly showers all over similar touchscreen phones.